“I demand that you stop calling me a liar and attacking my character,” Leigh Corfman wrote in a letter to Alabama Senate candidate Roy Moore published on Tuesday evening. Corfman is one of the numerous women who has come forward since the beginning of November, alleging that the conservative Moore sexually assaulted her when she was 14-years-old. Corfman told the Washington Post that Moore, then a 32-year-old assistant district attorney, “chatted” with her during a custody hearing. Corfman alleges that shortly after their initial meeting, Moore sexually assaulted her. She repeated the allegations, detailing her disturbing interaction with Moore on the Today Show. Corfman delivered the letter to AL.com shortly after Moore made an appearance at a campaign rally on Monday. 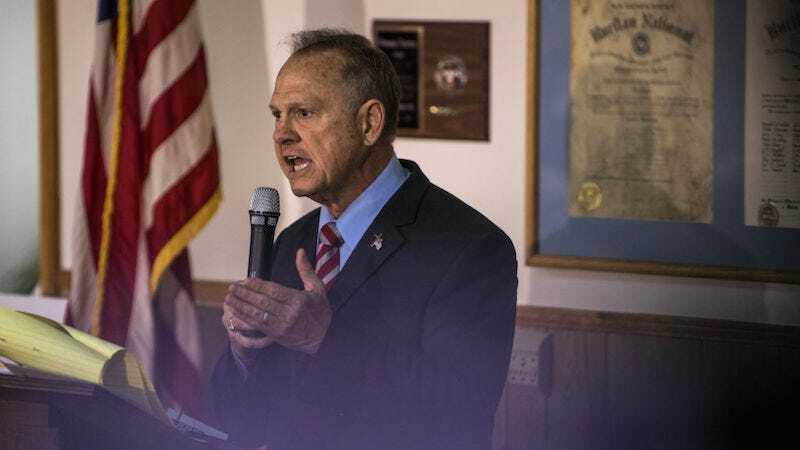 The paper reports that Moore reiterated his response to the mounting number of allegations of sexual impropriety and assault, calling them lies and claiming that the women were and are strangers to him. “I don’t know any of (the women),” Moore said in his first public appearance in nearly two weeks. He again called the allegations “completely false” and “malicious.” “I ever engaged in sexual misconduct with anyone,” he said. [...] When you personally denounced me last night and called me slanderous names, I decided that I am done being silent. What you did to me when I was 14-years old should be revolting to every person of good morals. But now you are attacking my honesty and integrity. Where does your immorality end? Though Moore’s numbers have declined since the Washington Post first published its story, new polling shows that he is still five points ahead of his Democratic opponent, Doug Jones. Moore’s strategy of denial and silence, mixed with attacks from proxies and grotesque defenses of his interactions with minors, has been enough to keep him in the lead. It’s a telling indictment not only of the Alabama Republican Party but of a national party willing only to offer apathetic lip service to the allegations against Moore. For his part, Donald Trump has endorsed Moore but refused to campaign for him. That job will be left to former Trump advisor Steve Bannon who announced on Wednesday that he will campaign with Moore next week. Read the entirety of Corfman’s letter here.